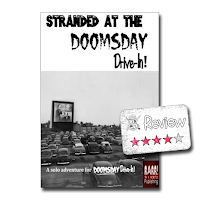 Frugal GM Review: Stranded at the Doomsday Drive-In! This week I'm going way off on a few combined tangents for this week's Frugal GM Review. You know how OBS likes to throw up personalized suggestions based off of your purchase history? 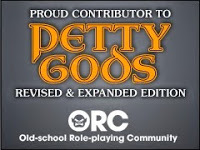 Well on DriveThruRPG I skipped past that and looked at the "Exclusively on..." list. I'll poke through that list but I'd say at least 99% of what is there are items I don't need/want/could care less about. If I have to spend my money on review products I tend to get things I think I could use. Today I went far off the reservation and picked up a tiny solo adventure for a game system I've never heard of (or at least don't remember hearing of). Stranded at the Doomsday Drive-In! is an adventure for Doomsday Drive-In RPG. I was drawn in by the catchy title and the fact that this adventure was presented in the Pocket Mod format, something I've used before and promoted before. Another thing that this product had going for it was the fact that it was designed to be a re-usable solo adventure. Now obviously I can't speak to the quality of the adventure for the game system, but then I didn't pick this up for those qualities to begin with. This download is one page, or eight pages put together as the one page Pocket Mod. The layout was simple and I liked the way the author added in a couple of different play options, "easy" and "hard". At first it didn't seem like there was any consistency in the layout of the many small tables used, but after re-reading it is simply that there were two different styles, with the slightly more complex tables being outlined and the simpler tables get a simpler format. The PDF is secured with a password, which is super trivial for a one-page printout. I did like how the OBS-applied watermark is on the cover portion of the PDF. I don't know if this was planned or not, but I like it. The PDF properties haven't been filled out, which is something I've been looking at closely lately. I don't even bother with this on my maps anymore and for all I know the source document could have had all this before Pocket Mod did its thing. Overall I only have a couple of criticisms. The first, and largest, is that there are no folding instructions for making the Pocket Mod work. I know for a lot of us this wouldn't be an issue, but if a first-time user got a hold of this, the directions might have been useful. Adding a second page wouldn't have been a bug deal. The author could have used the extra space to put in character sheets, and ad, or just made a full-sized sheet of instructions that weren't intended to be printed out. The last criticism is that there isn't any accreditation on the art. There are only two pieces of art and one could easily have been purchased from Shutterstock, but the other......I don't think it was public domain art. Copies of it are on several blogs & Flickr sites, but that doesn't make it free to use commercially, or maybe even at all. Even though I don't play Doomsday Drive-In RPG and will never get to try Stranded at the Doomsday Drive-In!, I think this is a good example of some different techniques to "spice up" a solo adventure. It got me thinking of a few ideas and 50¢ for some idea generation sounds like a good purchase to me.